“Tanhai” is a story about a father of two children, Faaiz, whose wife deceives him and leaves him. Faaiz’s mother gets him married again to girl, Gia, who belongs from a to middle- class family. They face a lot of problems at first but with the passage of time things seem to get better. When Faaiz’s first wife Aarzu hears about this marriage, she starts to interfere and causes trouble between them. 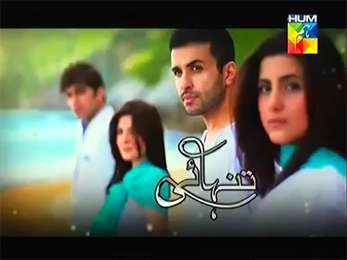 Will Faaiz be able to save his marriage this time or will Aarzu succeed in her evil plans? To find out watch “Tanhai” from February 27, every Wednesday night at 8:00p.m.